Baker, G.R., A. MacIntosh-Murray, C. Porcellato, L. Dionne, K. Stelmacovich and K. Born. 2008. "Jönköping County Council." High Performing Healthcare Systems: Delivering Quality by Design. 121-144. Toronto: Longwoods Publishing. "Jönköping County opens the minds of their peers and offers hope, encouragement, and new ideas. Their superb teamwork and organization have helped us all to think more clearly and to act more boldly." For the past decade Jönköping County Council - a county council in southern Sweden serving a population of less than 340,000 - has gained national and international recognition for making and sustaining large-scale improvements in healthcare. For many international leaders in the field of quality improvement, Jönköping exemplifies the innovation, strong and stable performance and social values on which Swedish healthcare was founded, and provides a model of healthcare system transformation that ranks among the best in the world. While Jönköping was a well-kept secret for some time, it has become a popular site to visit for healthcare leaders eager to learn more. 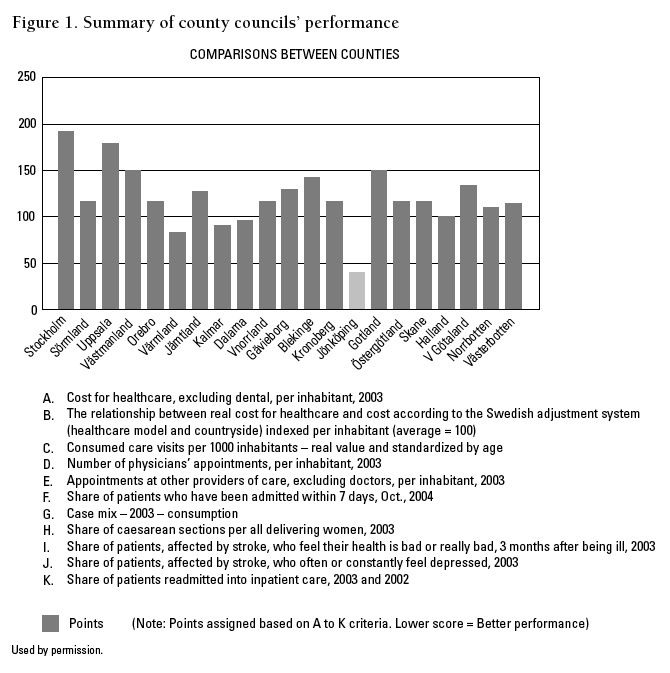 Figure 1 shows that compared to the other 20 county councils in Sweden, Jönköping achieves the best overall ranking on indicators across Sweden's six goals for quality: efficiency, timeliness, safety, patient centredness, equity and effectiveness (Jönköping County Council 2005). Jönköping has dramatically reduced its rates of sepsis and made impressive measurable gains in chronic disease management while reducing staff absenteeism and turnover. The council estimates that its work on efficiencies has led to 80 million SKr savings ($13.5M CAN), or 2% of its net costs (Jönköping County Council 2005). Jönköping has won national recognition by the Swedish quality award for healthcare - Qvalitet, Utveckling, Ledarskap (QUL) - on multiple occasions over the last decade. This award is often referred to as the Swedish Malcolm Baldrige award. Esther is a persona that clinicians in Jönköping invented to help them improve patient flow and coordination for seniors in six of the county's municipalities. Care for the elderly is a critical issue in Sweden, a country that has the world's oldest population (18% are aged 65 or over). Esther is an 88-year-old Swedish woman who continues to live alone in the community but has a chronic condition and occasional acute needs. Beginning in late 1998 Jönköping clinicians and leaders came together to map Esther's movements through the complex network of care settings and providers. In addition, interviews were conducted with patients like Esther and clinicians who provide care for her across the system. This exercise provided a starting point for identifying and working on improvements in the way patients flow through the care system. Much work was done to align capacity with demand and to strength coordination and communication among providers. Examples of changes made included a redesigned intake and transfer process across the continuum of care, open access scheduling, team-based telephone consultation, integrated documentation and communication processes and an explicit strategy to educate patients in self-management skills. The Esther project yielded impressive improvements over a three- to five-year period, including an overall reduction in hospital admissions by over 20% (9,300 to 7,300) and a redeployment of resources to the community, a reduction in hospital days for heart failure by 30% (from 3,500 days per year to 2,500) and a reduction by more than 30 days of wait times for referral appointments with specialists such as neurologists (Institute for Healthcare Improvement nd b). Pursuing Perfection was an ambitious project funded by the Robert Wood Johnson Foundation and directed by the Institute for Healthcare Improvement (IHI) in the United States (US). The goal was to create system transformation across all major healthcare processes. Seven successful US health system applicants received over $2 million each through a competitive process to participate in this initiative. Jönköping (and several other international health systems) participated without this funding. Jönköping County Council leaders considered their Pursuing Perfection efforts to be an investment that built on the Esther initiative and helped to transform the way care is provided. Top managers wondered whether it would be possible to develop "a Toyota in healthcare." Their efforts focused on developing new ways of working and tools at three levels: leadership, new designs and innovations, and front-line results. Jönköping leaders and clinicians focused their efforts on systems thinking at all levels (i.e., macro, meso and micro) in several areas, including achieving access in every office, improving patient flow, asthma care, elder care, partnerships for children's services in the county, prevention of influenza and patient safety. This work led to substantial streamlining of processes and cost savings across the system, including in surgical units and orthopaedic clinics. Key changes included role redesign with occupational therapists and nurse practitioners having more enhanced roles in doing follow-up exams. By bringing together all providers and resources for children with asthma in the county and by mapping and improving processes, Jönköping reduced the number of hospitalizations for pediatric asthma to 7 per 10,000 (Jönköping formerly had 22 hospitalizations per 10,000; the US national average is 30 hospitalizations per 10,000). Jönköping's rate of influenza vaccination increased by 30% (over four years), translating into substantial reductions in acute care hospital admission as well as in morbidity and mortality among the elderly population. Jönköping County was considered the highest performing of all Pursuing Perfection sites, financially and clinically, thereby demonstrating "that gains are possible when innovative design meets rational resourcing" (Institute for Healthcare Improvement nd a). These results are impressive. But beyond what is published in facts and figures - comparative county-level performance rankings, awards, key improvement initiatives and results - little is known about how Jönköping developed into a system capable of improvement. In June 2006 a team of researchers from the University of Toronto's Department of Health Policy, Management and Evaluation visited Sweden. This site visit was part of an initiative called Quality by Design, which aims to identify and define elements of healthcare systems capable of improvement with a view to helping to inform strategic investments in improvement capability in Ontario. Quality by Design is funded primarily by the Ontario Ministry of Health and Long-Term Care in partnership with the University of Toronto's Department of Health Policy, Management and Evaluation. Jönköping County Council was one of five healthcare systems selected from a short list of high-performing systems nominated by a panel of international leaders and experts. In Sweden the team met with and interviewed administrative and clinical leaders, support staff and front-line staff working to make improvements at regional and organizational levels in Jönköping, and leaders and stakeholders in Stockholm at the healthcare system's national level. These interviews helped to provide a balanced and detailed perspective of the evolution of Jönköping County Council's investments in improvement capability, and the strategic drivers of sustained improvement at Jönköping, including the role of national-level or external influences. This case study highlights the findings of this site visit. Sweden's healthcare system is a publicly funded comprehensive system with an international reputation for strong performance, equity and innovation. In the early 1970s Sweden was among the first countries to recognize the limits of hospital care and to make a national commitment to primary care and preventive services (Glenngård et al. 2005). Compared to systems in other industrialized countries and international standards, the Swedish system manages to balance superior access and medical outcomes with moderate resource and cost levels (Organisation for Economic Co-operation and Development 2005). Rooted in a social ethic of participation and partnership, the Swedish system is highly decentralized and aims to achieve its objectives through public ownership as well as local and regional democracy, operation and accountability. Since 1982 regionally elected political bodies called county councils, which typically include several municipalities, have been funding, planning and delivering healthcare services. They base their work on broad principles that guide planning and delivery as well as on goals for quality established by the central government. Healthcare is a dominant focus for county councils, comprising over 70% of their resources (other responsibilities include cultural activities, public transportation and regional development). County councils finance their healthcare expenditures by levying proportional income taxes (in addition to taxation revenue, healthcare financing is supplemented by state grants and user charges). They plan and allocate resources to healthcare, dental care, education and research for their jurisdictions, own and operate all their healthcare facilities and contract with healthcare providers. The councils employ salaried, community-based primary care physicians. Hospitals, which are owned and operated by the county councils, employ salaried, hospital-based physicians (Glenngård et al. 2005). Other national organizations that influence healthcare in Sweden include the National Board of Health and Welfare, which sets standards for patient safety, performance assessment and practitioner licensing. The Swedish Association for Local Authorities and Regions (SALAR), a result of a recent merger of the Federations of County Councils and Local Authorities, is the county councils' membership organization. The SALAR advocates for county councils and regions in government and reports publicly on their performance, supports quality improvement and oversees relations with labour unions (Stenberg nd). Appendix A lists the SALAR's priorities for the near future. Jönköping County is located 330 km southwest of Stockholm in the southern province of Småland. It has three hospitals and 34 care centres (including primary care clinics, specialized medical services, rehabilitation facilities and pharmacies), with a combined workforce of over 9,900 across 13 municipalities (Bojestig, Henriks and Karlsson 2006). Many people consider Jönköping County to be both the spiritual and entrepreneurial centre of Sweden: it is home to the country's largest number of religious establishments (leading to references to its status as "Sweden's bible belt"), while Småland is the origin of Ingvar Kamprad, the founder of IKEA. Jönköping County Council is proud of its strong connection to its communities. The council's vision - "For a good life in an attractive county" - was developed after 400 hours of dialogue with leaders and stakeholders across the region. This vision, which resonates with Swedish values, has remained constant for more than a decade. Leadership has been key to the achievements of Jönköping County Council and its ability to make and sustain improvements in quality. Over the past 18 years Sven-Olof Karlsson, the council's chief executive officer (CEO), has led the council's single management system. This is the longest tenure of any county council CEO in Sweden. In addition to continuous leadership at the chief executive level, there has been (until recently) a stable majority of politicians elected to the council's assembly, led by the same chair, throughout Karlsson's tenure. Functioning like a board of directors, Jönköping's assembly is made up of 81 politicians elected every four years. As a governance body the assembly holds public meetings four times a year to set and monitor the council's strategic plan and to make decisions about the tax rate, often with members of the opposition sitting at the same table (Bojestig, Henriks and Karlsson 2006). In fact, Jönköping's board chair is from the Social Democratic Party, which is in opposition to Jönköping's political majority, the Christian Democratic Party. A frequent challenge with this politically driven, large-size governance structure is the change in power every four years and the unwillingness of board members to maintain an arm's length distance from day-to-day operations. In counties across Sweden, CEOs often struggle with board members' meddling with their front-line workforce (board members visit healthcare facilities to lobby for votes and influence specific decisions). This was not the case in Jönköping. Over time Karlsson and his board chair, Lars Isaksson, developed a sound working relationship underpinned by trust. By engaging the board in open, consensus-based decision-making, by clarifying roles and mutual expectations for board members and leaders and by demonstrating strong performance for the system, Karlsson and his chair gained other board members' confidence. Continuity, transparency and trust won over political partisanship, and board interference in day-to-day operations is virtually non-existent in Jönköping. Formerly the county council's chief financial officer, Karlsson has been credited with developing and reinforcing Jönköping's culture of financial discipline and the region's spirit of open dialogue. During the past decade Karlsson and his senior team have paired Jönköping's long-standing commitment to strong financial performance with a strategic focus on quality improvement. Two key members of Karlsson's senior team - physician leader Mats Bojestig and learning and innovation leader Göran Henriks - have been particularly instrumental to this evolution, which began in the early 1990s. In the early 1990s the Swedish healthcare system was in a state of economic crisis, which was reported as the worst in Europe. Access was a major problem; wait times, particularly for elective procedures, were at an all-time high and increasing; the quality of home care was poor; and community services were underutilized (Stenberg nd). In addition, the number of elderly people was rising quickly, contributing substantially to healthcare costs and worsening budget deficits across county councils. By the mid 1990s the Swedish government enacted policies designed to address the crisis, including a Wait Times Guarantee (Stenberg nd). County councils at the same time shifted into a mode of cost containment. Although Jönköping had a foundation of strong financial performance and open dialogue, the county started to feel the effects of the economic downturn. By 1995-1996, tensions among politicians and leaders were rising. In addition, feeling the pressure of the guarantees, healthcare facilities across the county were asking and competing for increased capacity (i.e., more beds, clinicians and space) to help them deal with issues of access. Around that time two members of Karlsson's senior team, Bojestig and Henriks, had become increasingly familiar with various frameworks and tools, such as the Malcolm Baldrige quality award criteria, audit and measurement tools and principles of total quality management. Bojestig, an internist/endocrinologist at Höglandet Hospital since 1984, had become involved in a national effort to develop QUL, Sweden's version of the Baldrige criteria. Henriks, a former Swedish National Basketball coach who had held various roles in education and quality at Jönköping since 1982, deeply understood process and systems thinking (using strategic measurement to monitor and plan different dimensions of performance) and the importance of learning better habits for change and improvement. Henriks saw healthcare workers as knowledge workers. In the midst of the national crisis Karlsson and his senior team began actively to use frameworks and tools, particularly those introduced by Bojestig and Henriks, to provide an objective picture of performance and to guide decision-making. Karlsson was worried that efforts to make changes to contain costs would harm patients. He wanted more and better information and an even more open dialogue with leaders, politicians, staff and patients. Management and measurement tools such as audit instruments (e.g., Audit Group for Medical Evaluation, Swedish Organizations Granskning) and the Balanced Scorecard helped Jönköping's leaders use numerical data to measure and understand their performance across parts of the county on different dimensions and over time (Jönköping County Council 2005). This information was included in a new annual report that went to stakeholders and became central to Jönköping's "dialogue" as a system. Communicating objective information that showed widening variations in efficiency (beds and staff per capita), costs and quality across the county and over time helped to convince board members and county leaders that adding capacity was not an effective solution. Furthermore, interviews with patients and clinicians confirmed that integration and coordination of care were significant issues, especially for the aging population. In the short term this exercise led to the initiation of projects designed to improve integration and continuity of care (e.g., Esther). In the long term it led to a more balanced and data-driven approach to strategic and budget planning for the council. Karlsson began to establish a closer linkage between finance and quality, homing in on value for patients instead of just costs and maintaining an ongoing strategy of making modest capital expenditures, removing waste and improving quality as a means of cost reduction. As he noted, "Work on quality does not mean a distraction from a focus on finance - it is an expectation that healthcare areas maintain and reduce costs." Through a self-assessment using the Swedish Baldrige/QUL criteria and an introduction to the principles of total quality management, Karlsson and his senior team began to use these as a framework for developing a more central and strategic focus on quality. Bojestig, Henriks and others knew that while the use of new tools had helped to move Karlsson and Jönköping's senior team beyond a focus on finance, new ideas and frameworks for planning at a senior level were "not going to be enough to improve the system." Initiatives to improve quality were being led by a few champions in three disparate parts of the county and were not yet yielding major system-wide improvements. There was a need for more strategic guidance, support and coordination of these initiatives. It was also critically important that management and front-line staff become better oriented toward process and systems thinking in their everyday work and learn how to systematically test changes in process on a small scale. At the time Henriks asked, "How can we really help people optimize their work?" Although Karlsson had been intrigued by and began to use tools for total quality management, he was still uncertain of the need for more significant investment in improvement skills and capability. After all, at the time Jönköping was already conducting more improvement initiatives and consistently performing in the top quartile of county councils on all cost and quality indicators. Henriks and Bojestig had attended the IHI forum in the US for several years, experienced intense learning and received inspiration from leaders in high-performing improvement-focused systems: they knew what was possible. After a few unsuccessful attempts, Henriks and Bojestig convinced Karlsson to join them at the annual IHI forum. In agreeing to attend, Karlsson articulated one caveat: the team was to "work together to prepare beforehand, while at the forum and upon their return" in order to harvest all relevant learning that would add value to the work Jönköping County Council was undertaking. In 1998, after meetings to prepare, select sessions and establish learning objectives, Karlsson and his entire senior team attended the IHI forum in New Orleans. The experience of attending as a team led by the CEO, of explicit planning and debriefing and of hearing the same ideas and stories about improvement were important catalysts at Jönköping. Karlsson and his team began to develop more detailed knowledge of improvement methods and they began to understand issues of performance as being process- and systems-related. They also came to recognize the methods and context needed for change and improvement and the importance of investing in educating their workforce in the skills and knowledge associated with improvement. One of the most important methods was a simple yet powerful tool for action-oriented learning called the Model for Improvement. This model asks three fundamental questions to help teams set aims (What are we trying to accomplish? ), establish measures (How will we know a change is an improvement?) and select changes (What changes can we make that will result in improvement?). The model also includes the Plan-Do-Study-Act (PDSA) cycle that guides the testing and implementation of changes in a real work setting and accelerates improvement (Langley et al. 1996). This knowledge acquisition by Jönköping's senior leadership coincided with two national-level developments. First, in 1994 the National Board of Health and Welfare developed a series of regulations on quality issues. These regulations, which were reworked in 1997, state that all health services in Sweden must include a system for continuous quality improvement. The revised version shifts the emphasis from quality assurance (defined as monitoring and improving technical measures of quality) to quality improvement (continuous, target-oriented development focusing on the people for whom health services are intended) (The Swedish Institute, 2003). Second, the Federation of County Councils, which eventually merged with the Federation of Local Authorities to become the Swedish Association for Local Authorities and Regions, had started to provide central support for improvement by organizing an annual Quality Conference, the QUL award and Breakthrough Series modelled after the IHI's approach. The approach is an action-based learning series that brings together teams working collaboratively toward a common improvement aim. Breakthrough Series collaboratives attempt to spread and adapt existing content knowledge through the development and use of improvement knowledge and to create opportunities to share progress and ideas across teams. The goal is to achieve significant and rapid changes that produce breakthrough results. The Federation also began to fund demonstration projects and develop a leadership network for improvement. A group working at a national level within the Federation had also begun to develop a quality agenda with a focus on improvement. This group, led by leaders such as Margareta Palmberg and Michael Bergstrom, had undergone its own evolution in terms of developing improvement knowledge and an enhanced understanding of the importance of a strategic focus on improvement in order to generate a sustainable healthcare system. Furthermore, this group had begun to develop an informal relationship with IHI, attending conferences and courses and engaging Paul Batalden, the physician and improvement scholar at Dartmouth Medical School in New Hampshire. Batalden's expertise, particularly in systems thinking, was considered instrumental in contributing to some of these national-level developments. While Jönköping County Council participated in the Federation-led Breakthrough Series and other activities, it was already further ahead than most other counties in making process and patient-focused improvements. The council had also already adapted the Breakthrough Series model to suit its own needs (e.g., placing a greater emphasis on developing process knowledge at the outset; focusing on teamwork and organizational development). While the Leadership Network provided a venue for dialogue and sharing among CEOs and other decision-makers, Jönköping had already started to invest locally in leadership development and education across various council levels. Although the growing quality agenda and activities at the national level began to assist other county councils that were motivated to improve but needed guidance, support and momentum began to wane. Nationally, leaders were increasingly focused on other issues (e.g., rising unemployment in some areas of Sweden), and views diverged on the importance of process-oriented quality improvement as opposed to other approaches, such as standards-oriented technology assessment. Leaders saw more important and urgent alternatives for the use of funds. As a result, money originally earmarked for the quality improvement agenda was directed to human resources planning, with a parallel turnover of some of those involved in pioneering the improvement agenda at a national level. According to some observers, "This was a lack of senior leadership vision." By 1997 Karlsson was committed to developing Jönköping as a system capable of improvement, and he understood more about what was required to make that happen. Karlsson began by making a few key strategic changes to his leadership team. In 1997 a new position was developed for Henriks, who became chief of learning and innovation. While the pairing of clinical and executive leadership is common in most counties, Karlsson's emphasis on developing and providing time, resources and decision-making ability to a leader who championed quality, learning and coaching process improvement was uncommon. This unique set of complementary skills and roles at a senior level set the stage for a more system-level approach to investing in improvement capability and to shifting improvement from a series of projects to a way of leading and working. More recently, in 2006 Bojestig was named chief medical officer and planning director. These changes have supported Jönköping's transformation into a healthcare system driven by leadership and focused on clinical results. In the initial wave of county council-wide education that took place from 1997 through 1999, senior leaders, managers and front-line teams learned they had two jobs: "to do what they do (i.e., manage, provide care) and to improve what they do." They learned about the values of the Malcolm Baldrige/QUL quality award and how those values were critical for improving patient care at Jönköping at all levels. They also learned about the Balanced Scorecard and the importance of paying attention to multiple dimensions of performance simultaneously: units and programs across Jönköping developed their own scorecards and used them for planning and monitoring. Participants were taught a common improvement language, methods and tools, and particularly the Model for Improvement and the PDSA cycle, so as to better understand and map change processes on a small scale in order to improve care and create value for their patients. They also learned about thinking reflectively about their work, teamwork, the interdependencies of their work and managing change. Management was also restructured to align with this learning. Managers and clinicians who were working on improving common or linked processes across the council came together regularly to share ideas and progress, and managers and clinicians were assigned as process leaders. Over time this effort led to the education of large numbers of staff, the start of a redesign of 53 processes and was critical to the success of initiatives such as Esther (Jönköping County Council 2005). Results across the small parts of the system create big results for the system ... and lots of winners. ... Big, high-risk projects and changing structures in a traditional way, buying and selling and depending on the market, creates losers. The impact of this strategy was visible across Jönköping County. For example, staff at the Vaggeryd Primary Care Centre began to measure their performance regularly and to test changes in process using daily huddles and active data walls. The clinic management and staff documented a new set of "ground rules" for working at the Centre, stating that all staff would be responsible for improving work, that a culture of continuous improvement would be built together by seeking the wisdom of all staff members and that information and results would be transparent (Jönköping County Council 2004). At the same time the Office for Learning and Innovation, and most of the early quality education, had been physically situated at Ryhov Hospital, Jönköping's largest. Despite strong leadership support and expectations to participate, front-line staff members found it challenging to avoid day-to-day distractions, especially if they were working at Ryhov Hospital. Furthermore, this arrangement made it more difficult for the Office to be a visible support for learning and improvement across the entire region. Leaders at Jönköping County Council established the Qulturum learning centre in 1999 in response to these challenges. The centre is a standalone building located on the central campus of the council's healthcare facilities. Funded by 0.03% of Jönköping's annual budget and a partnership with the Swedish Pharmacy Association, Qulturum, which means "meeting place for quality and culture," was carefully designed. Its physical structure and layout allow small and large groups to meet and learn together in open dialogue or "learning arenas," using technology when necessary. Even the aesthetics of the rooms are designed to stimulate thought and learning. Qulturum also provides a common language for all staff: Henriks calls Qulturum an "institute for language" that links staff members together on common ground because their own "languages (e.g., finance, clinical) are still so different." Henriks leads Qulturum and has strong support from Karlsson and other senior leaders who regularly interact with the staff and participate in teaching and learning. Qulturum has an explicit strategy for staff recruitment and development. Personnel are carefully selected from among the county's front-line champions. Many staff members were nursing, medical or allied health workers. Specialist skills that are sought and further developed include front-line team facilitation, project management, leadership development, improvement methods, data collection and measurement for improvement, process mapping and patient-safety-related methods such as root-cause analysis. Supported by Qulturum, Jönköping County Council reports having made over 800 measurable improvements. These encompass all seven of the council's strategic aims: good stewardship, medication, learning and renewal, safety, access, flow/co-operation and clinical improvement. Unlike many other systems that have emphasized "practical" improvement methods rather than ones based in theory, Qulturum attempts to bridge this divide. The key principles for the support and training Qulturum provides are its alignment with the council's strategic aims, its link to action and its grounding in improvement theory. Qulturum provides support for system-wide and unit-based projects using a modified version of IHI's Breakthrough collaborative model to ensure ongoing learning and support for staff and leaders as they make changes to care processes. Integrated into learning sessions are the theories of Senge, Juran, Deming and others, as well as the use of rapid-cycle methods, the Clinical Value Compass and other tools. To date, 4,000 of the 9,000 staff members and leaders across the system have received such theory-based and action-oriented quality improvement training at Qulturum. This centralized investment in a long-term strategy of developing internal expertise and the capacity for internal skill and knowledge development counters a common habit of making externally driven investments in improvement knowledge and skills and only limited investments in the education of front-line staff and managers. Ironically, this investment in Qulturum has also meant that Jönköping's senior leaders can continue to maintain financial discipline and a policy of "no new money" for improvement for individual organizations and programs (aside from specific capital projects). Programs and teams have access to improvement support and facilitation from Qulturum staff, and they fund changes through process improvement. An important feature of improvement at Jönköping is the strategic harvesting and adapting of ideas from international training programs, centres and experts. Henriks and others at Qulturum carefully screen new ideas and tools and adapt and introduce only those that will help Jönköping to advance. Henriks and his colleagues are also careful to ensure that any external relationships they forge to train, learn or harvest ideas are developed at the interface between coaches and trainers and not at the front lines: "We have a rule of not bringing in consultants to solve our problems. ... We are of the mindset of see one, do one, teach 500." They regard this approach as an efficient way of learning from others and building internal capacity/capability as well as corporate memory, habits and ways of working. For example, by 2003 patient safety had become a strategic priority at Jönköping. By 2005 two Qulturum staff members had participated in the IHI's Patient Safety Officer program. By 2006 that program had been adapted to meet Jönköping's needs in patient safety knowledge and skills, aligned to the learning model used at Qulturum and implemented for staff across the Jönköping region. At a conference in 2004 Qulturum staff heard about the work of the United Kingdom's National Primary Care Development Trust to engage patients in self-management using improvement methods. Given Jönköping County Council's focus on care for seniors in the community, a focus that includes chronic disease management, preventive health and strong community connections, the council adapted this concept to launch the Passion for Life initiative. This initiative uses a version of the Breakthrough Series model to teach seniors to use improvement methods and measurement to learn about and test changes in their diet, occupational safety and other care areas. The initiative also provides seniors with an enhanced social network and access to a primary care physician on an occasional basis. Funded through a partnership with the SALAR, and supported in particular by Michael Bergstrom at the SALAR, this initiative is spreading across Sweden and has generated momentum for patient-led improvements at Jönköping. Qulturum staff members working on the initiative say that "patients are now our teachers." Seniors identified as champions from the Passion for Life initiative visit clinical units to share their knowledge and use of the PDSA cycle with nurses. More recently, Henriks and his colleagues learned from experts in the US about ways of transforming care by working at the level of clinical microsystems (i.e., teams working at the front line of service delivery) (Nelson et al. 2002). This is a current and growing focus for Qulturum and Jönköping County Council. To help systematically manage the selection, introduction and spread of new tools and approaches Henriks and other leaders have recently begun to use a three-stage method involving testing, piloting and prototyping. In the test stage the tool or approach is introduced to and discussed with staff at Qulturum; in the pilot stage units across Jönköping are introduced to and invited to use the tool or approach and common measures are established; in the prototype stage the tool or approach becomes embedded in work and improvement (Jönköping County Council 2005). Despite the participation of physicians in education at Qulturum, Jönköping's leaders realized they needed a parallel approach in order to introduce improvement to the next generation of clinicians. To integrate clinicians' learning of improvement methods earlier and in conjunction with their learning of content knowledge, Jönköping initiated a partnership with a medical school and other health professions, programs in Sweden (Bergstrom and Thorne nd). Karin Thorne, a Jönköping-based physician working with Futurum (a new research-focused arm of Qulturum), led this partnership. One of the early accomplishments of this work has been the development of a network of medical residency supervisors trained at Qulturum and the creation of modules these supervisors can use for just-in-time training of physicians and other professionals on the units. As Thorne noted, "The learning has been very powerful. ... Clinicians are educated in the biological context and [yet] much more is needed for effective problem-solving." This work has developed into a national-level initiative supported by Bergstrom at the SALAR and has spread across four Swedish universities. By the late 1990s Jönköping County Council (with Qulturum as the primary engine) had made significant investments in improvement capability, in particular, the widespread development of enhanced knowledge and skills. Although improvements were being made and sustained, there were gaps in understanding how improvement at the team level contributed to system-level enhancement. A Jönköping manager recalled that "people sometimes felt as though they were not part of the strategic discussion." In a spirit of continuous learning at the senior level, Karlsson and other leaders reflected on the need to ensure that the Jönköping system maintained a strategic focus on improvement and ensured value for these investments. According to Boel Andersson-Gare, the chief of pediatrics at Jönköping County Council, "We have always had activities that have delivered good results, but no one took the responsibility for the entirety (Jönköping County Council 2005)." 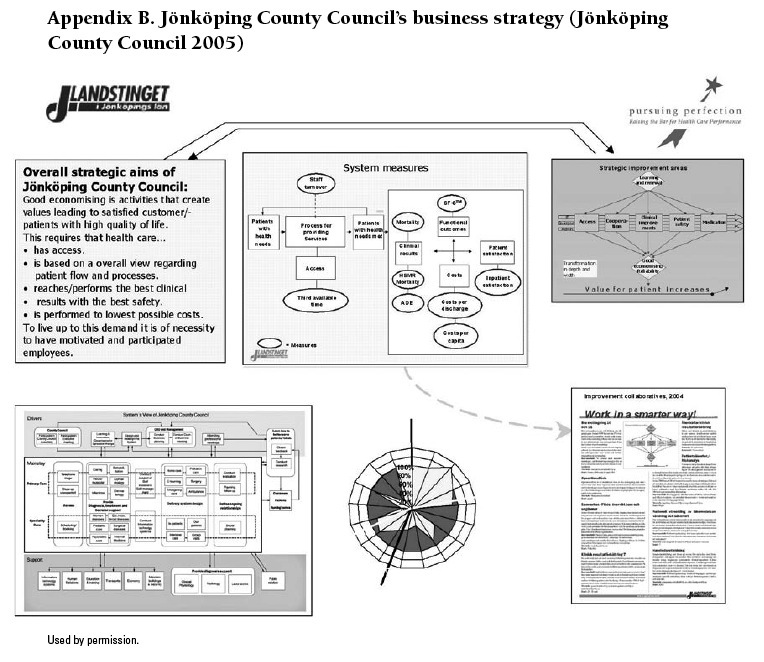 By 2001 Jönköping's leaders had tested a new approach for putting quality planning at the centre of business and strategic planning for the county council. Called Big Group Healthcare, this approach is a meeting of all executive, clinical and quality leaders and managers across the system over five days throughout the year. During these meetings leaders and managers gather in "circles of learning and open dialogue" to report on their progress in achieving strategic aims and to discuss how quality improvement initiatives are (or are not) contributing to these in measurable ways. Attendees use this opportunity to learn from their peers, to understand more about how the system is performing as a whole and to get involved in co-designing the plan for the health system. Big Group Healthcare has strengthened the ability of Jönköping's senior leadership team to create a context for system-wide improvement. It has also created a more explicit link between strategy, quality and finance and a tangible way to bring together learning and improvement (Qulturum), strategic aims and measures for the system and Balanced Scorecard results. Karlsson estimates that less than 40%-50% of the discussion in these meetings focuses on finance, a fact that makes it possible to focus on quality improvement. Much of Big Group Healthcare discussion focuses on considering the value that Jönköping is creating for its patients. 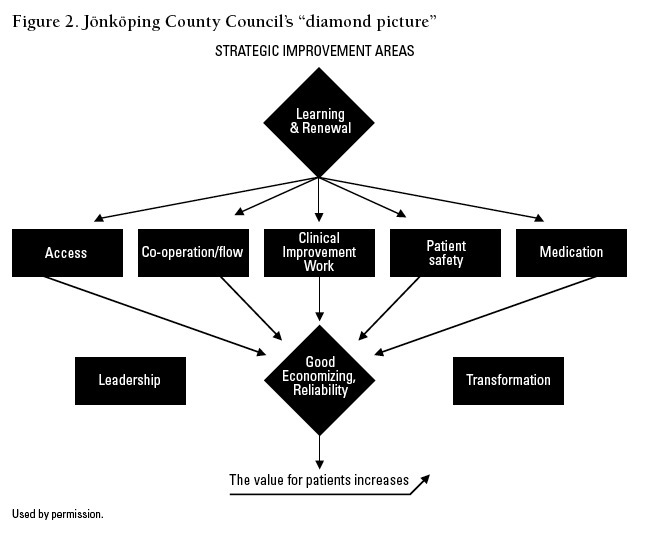 As a result of Big Group Healthcare, leaders and managers at Jönköping created the "diamond picture" to show how learning and innovation drives improvement across the strategic themes and that quality improvement, in turn, drives improved finance and reliability (see Figure 2) (Jönköping County Council 2005). Jönköping leaders and managers also redeveloped their annual budget plan and performance reporting to support and reflect these linkages. Results of Big Group Healthcare meetings are documented in a newsletter that is disseminated to staff across the system. According to the County Council's senior leaders, "People have a better understanding of the system and this has decreased the rumours that developed when they did not." Staff at different levels of and in different parts of the system are familiar with the diamond picture and with the business strategy as a whole (see Appendix B). Jönköping's leaders share their commitment to embedding these ideas in the system and its work: "We never change our pictures." In conjunction with Big Group Healthcare, the three hospital CEOs began to receive limited incentives (5% of salary) for demonstrating Baldrige-type values in their leadership. In addition to these incentives for leaders, Karlsson focused on removing typical disincentives for improvement across the system. For example, instead of reclaiming cost savings in the global budget, organizations and units that realize cost savings as a result of improvement are able to reinvest all of these funds. This continues to be an effective way to keep managers and staff focused on lean consumption and process optimization. 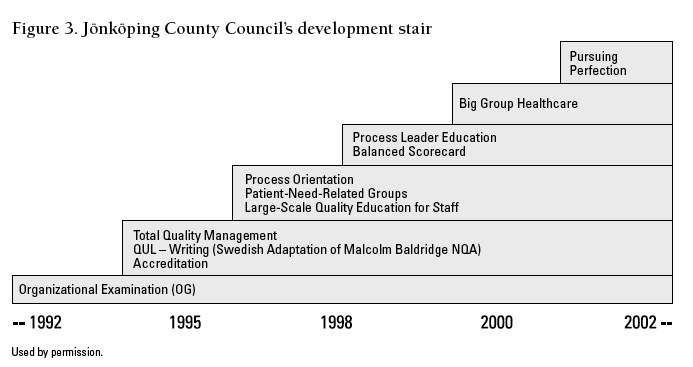 Jönköping County Council depicts its improvement journey as a development stair (see Figure 3) (Jönköping County Council 2005). The next step in its evolution - the step at the top of the stairs - is Pursuing Perfection. Big Group Healthcare exposed the system, including its imperfections, to Jönköping's leaders. As they continued to work to create and establish conditions that would allow change, Jönköping's leaders saw Pursuing Perfection as an opportunity to redefine and transform their system even beyond the goals that had already been accomplished: "We realized that the learning and work that would be most strategically important for our system was ahead of us." As we noted in the introduction to this case study, Jönköping County Council funded its own participation in Pursuing Perfection and received coaching and mentoring from US improvement experts such as Tom Nolan, Jim Reinertsen and Cliff Norman. Rather than seeing these efforts as an expanded group of projects, the Pursuing Perfection work and the advice of external experts pushed Jönköping and its leaders to redefine its entire system. 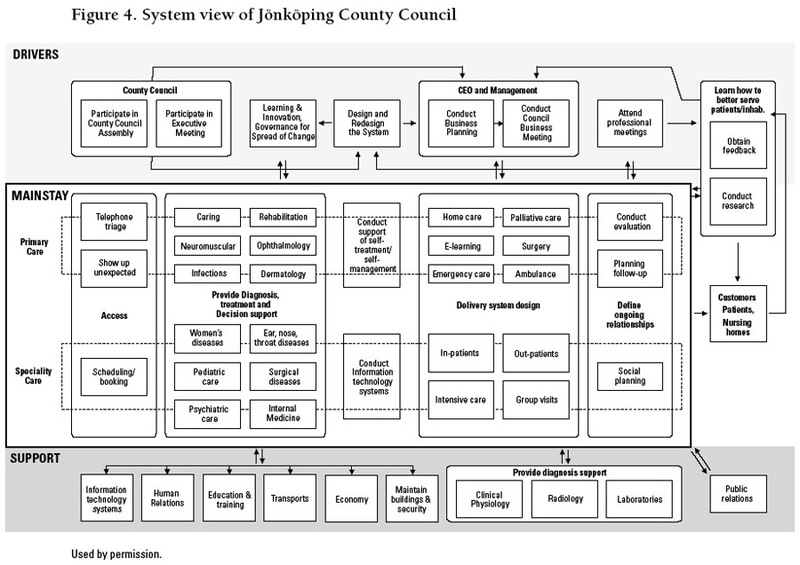 In doing so they came to understand better the linkages among drivers such as leadership and learning and support functions such as finance and human resources, as well as how these could optimally support the mainstay of patient care (see Figure 4) (Jönköping County Council 2005). This new perspective helped leaders and staff to appreciate their roles more fully and to recognize the interdependencies throughout the system and the opportunities they had to transform it. Pursuing Perfection pushed Jönköping beyond rapid cycle change to whole-system redesign. As noted above, this process included the redesign of roles and information systems that yielded more dramatic clinical and financial improvements than ever before. Jönköping County Council's investment in improvement capability has been characterized by a constancy of purpose for achieving quality in the context of financial discipline, strong and stable leadership and a steady learning journey for the entire system. As Karlsson and his colleagues approach two decades of leadership, they continue to learn and prepare for the next generation of improvement. To create leadership at the microsystem level with the new generation of front-line managers, Karlsson and Henriks are leading a 21-day leadership development program and Deming Days, which provide education about Deming's Theory of Profound Knowledge across the county. Bojestig has been named chief planning officer and is in charge of the new electronic health record and information system. Jönköping had developed an early warning system of monthly measures using a combination of administrative databases and manually collected data. The county is now attempting to move beyond this approach to a true decision-support system that will facilitate bedside improvement. Bojestig and his colleagues are striving to ensure this system will be integrated into normal workflow and will facilitate ongoing outcomes measurement. Jönköping's involvement in managing a number of Sweden's 57 national clinical registries is also increasing (Swedish Association of Local Authorities and Regions 2005). An initiative of the SALAR and the National Board of Health and Welfare, these registries include patient-level data on diagnoses, interventions and outcomes. They are considered to be one of the few major, long-standing and successful national efforts that support a knowledge base for improvement. The registries were initially managed by researchers and used mostly for research. County councils now play a more dominant role in their management, resulting in the more widespread use of the data for improvement. Among Sweden's county councils Jönköping was one of the earliest to use the registry data for improvement. The increased use of these data and recent involvement in managing three of the registries emerged from Jönköping's need for better quality and more timely information on clinical outcomes, a need that was particularly evident in the Pursuing Perfection initiative. Despite this progress several uncertainties loom on the horizon. Jönköping's leaders have always prided themselves on "doing it all ... we change everything at the same time." However, Qulturum's staff is beginning to feel overwhelmed: "We are going to burst" is a sentiment shared by some key support staff. Qulturum's staff faces increasing pressure to meet the ongoing facilitation and support needs of quality improvement staff in the hospitals and care centres and must also provide organized training for teams. At the same time, staff members are starting to develop informal networks with key support personnel in other organizations and to attempt to use the train-the-trainer model more actively; however, they are uncertain whether these initiatives will be sufficient. Clinical leaders expressed the need to be more focused and evidence-based in the application of improvement work to clinical groups, for example, using epidemiological data to determine priorities. Can Jönköping move from a culture of "doing it all at the same time" to focusing on priorities? According to one observer, "Political stability and leadership continuity are the single most important factors in Jönköping's success." Sweden's general election in September 2006 brought a new majority into power and a new chair for Jönköping's council assembly. In this context, how will Jönköping be able to maintain its momentum? Will these changes alter the direction of Jönköping's journey and steer it away from its strategic focus on improvement? Or, as its leaders suggest, are staff members now committed "by their own will and conviction"? Is Jönköping so far along on its journey that improvement is deeply embedded in its system? Will national-level organizations, and particularly the SALAR, enhance their roles in supporting systemic improvement beyond the support of a few critical individuals? Another county council in northern Sweden - Våsterbotten - has recently gained recognition for its work on improvement. Våsterbotten's approach mirrors Jönköping's to some extent, including an explicit link between the overall system strategy and daily improvement work, the use of improvement theory and methods, an emphasis on reflection and dialogue in improvement-focused meetings that bring together different levels of leadership, and high-performing microsystems (Andersson and Edström 2006). Little is known, however, about whether this work in Våsterbotten is producing system-level performance improvements. In a system that finds it difficult to accept and learn from "winners," will the lessons from Jönköping's journey and strategic investment, and the recent work in Våsterbotten, accelerate large-scale improvement in other county councils? Andersson, U. and A. Edström. 2006. Towards a Healthier System: A Brief Description of the Process of Transformation in the County Council of Våsterbotten. Våsterbotten: Våsterbottens Låns Landsting. Bergstrom, M. and K. Thorne. nd. Putting Improvement at the Heart of Education: The University Collaboration on Improvement Knowledge in Sweden and Lessons from the University of Jönköping and the County Council of Jönköping. Jönköping: Jönköping County Council, SALAR, School of Health Sciences (Jönköping University). Bojestig, M., G. Henriks and S.-O. Karlsson. 2006. Whole System Transformation. Presentation at the 2006 Institute for Health Care Improvement Forum, Orlando, FL. Jönköping County Council. 2005. The Future Is Now: A Paper Written for the Swedish Quality Price Gota. Jönköping: Author. Jönköping County Council. 2007. Budget 2007. Jönköping: Author. Langley, G.L., K.M. Nolan, T.W Nolan, C.L. Norman and L.P. Provost. 1996. The Improvement Guide: A Practical Approach to Enhancing Organizational Performance. San Francisco: Jossey-Bass Publishers. Nelson, E.D., P.B. Batalden, T.P. Huber, J.J. Mohr, M.M. Godfrey, L.A. Headrick and J.H. Wasson. 2002. "Microsystems in Health Care: Part 1. Learning from High-Performing Front-Line Clinical Units." The Joint Commission Journal on Quality Improvement 28(9): 472-493. Stenberg, J. nd. The Swedish Health Care System. Presentation at a meeting of the Swedish Association of Local Authorities, Stockholm, Sweden. Swedish Association of Local Authorities and Regions. 2005. National Healthcare Quality Registries in Sweden. Stockholm: Author.